The Franks family are upgrading the facilities at Oakdown Holiday Park in Sidmouth. Oakdown Holiday Park in Sidmouth, East Devon, is undergoing a major redevelopment, following a £500,000 cash boost. Park owners, the Franks family, have invested in ten new holiday units at the park as well as solar panels throughout and two new glamping pods, in addition to the three that were purchased in 2015. 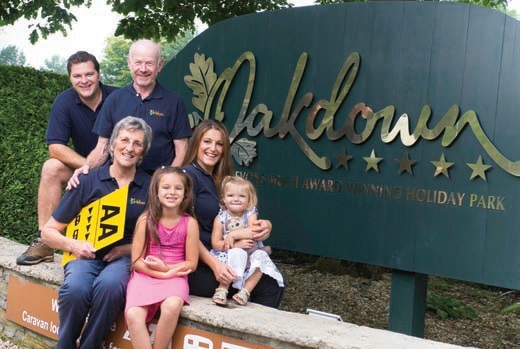 Last year Oakdown recorded more than 90,000 nights stayed on the park and a return visit rate of 80 per cent. Alastair Franks runs the park with his parents Doreen and Roger and wife Andrianna. He said: “We are always looking at ways to improve the park. Everything we do has to be in keeping with this beautiful area that we live in, so we take great care with our development.